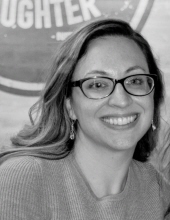 Melissa Reina, 40, of Somerville, NJ, departed this life on Monday, April 8th, 2019. Melissa was born in Houston, Texas; however, grew up in Hillsborough, NJ, before settling in Somerville. In her youth, Melissa attended Hillsborough High School and was a member of the Unitarian Universalist Congregation of Princeton. Melissa worked for 11 years as a Telecommunications Analyst in the Global Information Technology Department at Colgate Palmolive Co. In her spare time, she worked with the “Steps Together” Organization and enjoyed helping others. Melissa was also a devoted mother, whose children were the light of her life. Melissa is predeceased by her maternal grandparents, Martin and Lanka Ilkow; and her Aunt Joan. She is survived by her parents, Stephen and Ilene Logelin, her daughter, Gianna, her son, Jayden, her brother, Jason, her paternal grandparents, Marge and John Logelin, her Aunt Lorna and Uncle Tom and also her Aunt B. A Memorial Service will be held at 2pm on Tuesday, April 16th, 2019, the Unitarian Universalist Congregation of Princeton, 50 Cherry Hill Rd., Princeton, NJ 08540. Please note, for those attending the memorial service on Tuesday, due to heavy construction work on Route 206, an alternate driving route is advised. In lieu of flowers, donations in Melissa’s memory can be made to one of the following organizations:Ocular Melanoma Foundation, Center for Hope Hospice, Serova School of Dance, Steps Together Fund. To send flowers or a remembrance gift to the family of Melissa C Reina, please visit our Tribute Store. "Email Address" would like to share the life celebration of Melissa C Reina. Click on the "link" to go to share a favorite memory or leave a condolence message for the family.